Food Truck business is a very famous and a growing business in today’s time. With good food truck business plan in India you can acquire good return on investment in very short interval of time. Almost every country over the world is following the trend of mobile food business. The famous restaurants around the world has started this mobile food business business so that they can make their business grow in every part of the city. Especially in the countries like the United States, China, Australia, England has a large number of food trucks as compared to some other cities in the world. Now talking about India a clutch of entrepreneurs is doing a good business rustling up wholesome dishes in vehicles. They take their food on the street and attract people for the Indian cuisine and helping them turn their backs on the junk food. In Indian cities like Bangalore, Delhi, and Hyderabad you will notice that many food trucks in this cities provides Chinese food because of less hurdle in cooking and good profits, Many food truck in Bangalore serve north Indian dishes because of vast group of people has flooded from north India to start their career. If you are planning for food truck business in Bangalore, Chennai, Delhi, Mumbai and Hyderabad then there is lot of potential money that can be make from this business in very short period of time. As far as the investment required is concerned, you can have it set up around 5-10 lac in cities like Bangalore and Delhi. This much amount of capital will be enough to start this business in almost every city of India. 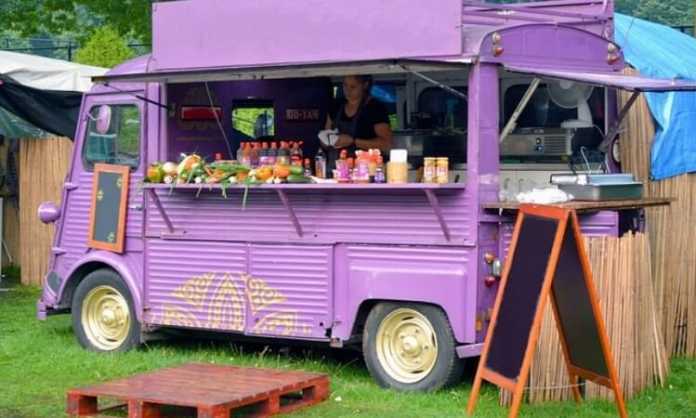 Food Truck Vehicle – You already know that the mobile food vehicle has some different interior and it is not similar to regular vehicle that we see on roads in India. You need to contact a food truck manufacturers in you city from where you can have it built according to your requirement. Installing a mobile kitchen in vehicle will not cost you much. Thing to consider in mind is that you should have to go with bigger vehicle like Traveller Bus which is generally used as office cab service. Installation of Mobile Kitchen In Truck – You can get the kitchen installed with the help of local manufactures or you can buy fully ready made food truck vehicle. It will be cheaper for you if you go for installation of kitchen by yourself. In order to start you first need to have proper license for it. First you need to get Food Business Operating License from FSSAI (Food Safety & Standards Authority of India). Another license you require is Eating House License provided by the Licensing Police Commissioner in your city. License from Fire Department in your city to ensure the compliance of all fire safety guidelines. You also have to get a Commercial Vehicle License from RTO in your city. If you do not have Food Business Operating License then you need to get a shop and establishment license from FSSAI India. Insurance for the vehicle and mobile kitchen equipments. The first question that comes to our mind when we think of this business is how to begin this business and what are the special requirements for it. In the beginning, it will have some small influence radius, but in near time it will help to earn more by reinvesting the revenues into the business growth. The business is sure to get good response within one year and can generate good net income with in one year of establishment. The legal hurdles and local brawls also play an important role in the growth and success of your food truck business. The above mentioned point plays a very important role when you think to start the food truck business in India. Many businesses in India run, on credit system, but in this business it is a bit tricky. The choice of your food menu will decide your target market like the age, veg/non-veg, special dietary needs and many other things. It is a type of business that needs a more practical approach than the theoretical research. Once your brand name is flourished you can start your business at the other places. In India when you think of a street food all you can think is the stalls that serve you the unhealthy fast foods which is not good for your health, but with the proper implementation of food truck business plan in India you can achieve big success in this market to serve the Indian food depending on the area and the state it is served in. This idea will really help you to flourish your business if you maintain your quality,hygiene and the most important taste of your food. So if you too are planning to start a food truck business, then you can start it today. Keeping the certain rules and norms in mind that you should follow while starting the business. Hey! I wanted to know whether can one get the food truck on lease in Mumbai. If yes, then what would be the approx charges and will it be profitable. Why not get your own customized food truck with all amenities. I wanted to know whether is it possible to run more than one food truck under the same brand name at different parts of the city. And thanks for sharing the above information.Will kindly be waiting for your reply!! Yes!! You can run more than one food truck under the same brand name at different part of the city in India but you need to have commercial license for each food truck separately. You have to register all your vehicle under same brand name for commercial use. Hawkers licence from municipal council or corporations is also required for each vehicle separately. 5 -You need to pay Income tax for revenue generated from all the trucks combined, obviously!! SIR THANKS FOR THE ABOVE INFORMATION YOU PROVIDED. — Cost will depend upon size of van and as per your requirement. — Select the Menu which sells good and you can change the Menu day wise if you are planning to serve in different location. If you want to serve food at corporate office area then keep the menu accordingly. Start with limited menu like meals for corporate employees. Menu changes with location and keep in mind that you have to outrank the competitor. – I advise you to start with low budget and expand it as per requirement. Hire 4 workers at beginning for small truck then grow it accordingly. Am from Orissa and I want to start a food truck business which will contain only Biriyani. So what should I have to do to have a food truck. Whether I will buy it newly or I have to make this one. What should be the investment..???? I really need your help sir ji..
Hi, Thanks for the very useful article. Given the way our government systems work, How much lead time does one need to consider to get through all the licences? 1. How difficult is it to take all the licenses that you mentioned above ? Cost for it ? also time line to get all approvals (in Visakapatnam, AP) ? 2. How much can we invest in customizing a TATA Ace vehicle for a Dosa food truck ? already I have three wheeler vehicle and I want to convert it into food van so please suggest me address and the phone number of food van makers from Pune.Maharashtra. I was planning to purchase a mahendra maximo auto on finance(Second Hand) and then contact local manufacturer to make kitchen as per my requirements. My question is that I already had a breakfast center n still have the kitchen items and wanted to know if those items(gas stand, dosa plate, small gas) will fit in the auto n what do you think will be approx cost. 1) Do we have to deal with traffic police or regular police? Can they cause a hindrance? 2) Please share more insight on how to get the license and how much is the approximate cost? Thanks for all the information. It helped a lot. 1. What is your opinion for the the idea of multi cuisine, Do you think it will work? Or should I start with a small menu and then go for the other things one by one according to the requirements and surveys. 2. Should I get a big van to start with or should I start with a comparatively small van and then get into it according to the profits. Because I would like to go beg term eventually. 3. Where to look for good chiefs and the reliable ones, if you have any in mind in Delhi please suggest. 4. I am not from Delhi, so will it be difficult for me to get all the licence for all the required things? Any suggestions for the same will help too. 5. Is Delhi a good place to go for it because I have two options Delhi or Jaipur. So which one would you suggest? Could you please let us know what places we can buy the food truck (first /Second Hand & contact person details in Telangana, Hyderabad). Where we can get the ready to go(full loaded with all required features) truck to start the business at the earliest? Please help me in providing the information? as i am from F&B background in Delhi and my hometown is in Agra. i want to start my own food truck near to the hotel accommodation, my main revenue part have to come from them only. need to how much will it cost for buying or rent the wheel fully furnished and how to deal with local police. please let me know how to get good chinese chef in that small city like Agra. what could be the aminities to strat this. don’t know where to start? how will i get the mentioned licences? what kind of food serv? is it require any partner for the business? can i get a franchise of food truck? how it works? lots of questions in mind but cant express it fully. Hey Vijay even m planning for the same in Mumbai,the best area to be targeted in Mumbai will be south Mumbai,because of thier spending power,yesterday i visited Napeansea road in south Mumbai,i found a food truck seller there selling Waffles,the minimum amount he was charging was 150 and people were very happy with the service and no hesitation of spending and as per my calculation he makes a sale of around 3-3.5 lacs a month and after deducting the expense he earns a profit of around 80-90k approx. Hi, i m from Delhi. Want to start a food truck business in Delhi NCR. I can invest upto 10 lac. I dont have any food business experience..
>>My major concern is the taste of the food and hygeine..?<<For that i need a good chef.. Please suggest me from where to get a good chef with less cost in Delhi NCR.. I am eagerly wiating for ur reply.. I am planing to stat up Truck business ,so could any one help me out. few query are following in the bellow . 1> whats the cost would be vehicle cost including set up . 2> what are the document need . Thank you for all the information above. It provided me much insight and answered a lot of questions. Actually, I am also looking for a partner, preferably with prior expericnce in food business, with whom i can plan to run a food truck . If somebody is interested or know somebody likewise please contact me. First of all plz confirm from which city do u belong. I have a hobby of kitchen designing and had vast experience in food industry . I have designed some restaurants in UP, Punjab, and Jaipur. I am also planning to have a start up. We can discuss on it. Thank you for purposel ,my name is prince and i am interested to join your concept. i live in delhi.could you call(08447090842) me so we can discuss deeply if still you not find any one. I’m from Chennai too. If you’re interested in teaming up please let me know. Someone please direct me to food truck manufacturers around Kanyakumari district, especially closer to Nagarcoil or Trivandrum. Hi, this is interesting… In fact we planned one but getting parking for truck in busy commercial area/road is a challenge here in Bangalore… As we are planning food on wheels specialising Biryani in bucket concept…! Hello everyone. I am in Mumbai. Very passionate about cooking. Have all the ideas in place. looking for some one to finance it. Would love to start up a food truck. If anyone is interested do get in touch with me. Thank you. Hey even m planning for the same in Mumbai,the best area to be targeted in Mumbai will be south Mumbai,because of thier spending power,yesterday i visited Napeansea road in south Mumbai,i found a food truck seller there selling Waffles,the minimum amount he was charging was 150 and people were very happy with the service and no hesitation of spending and as per my calculation he makes a sale of around 3-3.5 lacs a month and after deducting the expense he earns a profit of around 80-90k approx. Planning to make steamed foods. Want a vehicle that suits single person vending vehicle. Pls reply if any one can help with this kind of business. I am a noob .. Try Maruti omni….the cost will be reasonable. You can add a small generator and steaming equipments. Do keep us informed of the progress….. I am from Ahmedabad. Is it possible in Ahmedabad and on an average how much would it cost? Hi sir,where I can find ready made food truck in chennai??? Hi i am rajnesh .i want to know that food van is success in small city like budaun or bareilly. I am planning to start food truck.But I do not know how to find base location for the food truck where I can park it when it is not working? Pls can you suggest me. hi.. my name is nitin, putting up in delhi. I am planning to do food truck business in delhi ncr, but i dont have any idea that what the all procedure & all…. if anyone has idea for this business and interested to do business with me without any investment then contact me at – 9873937070.
hi… any food truck owners to share your experiences…? I would like to start business but where from i will get contact details of cook to prepare food. Can you help me in this ? Hello, Mini this might help you find yor desired truck in hydrabad.. i see a video regarding food truck manufacturing in india on youtube then i come to know about them.. i don’t know the company & manufacturer name but they leave their contact numbers for further Assistance about food truck.. you can contact them on mobile no. – 9849077810 you can contact them..
Hello , your blog is very informative and to the point for young entrepreneurs with a food truck idea in their mind but don’t know the how to go about it . 1) should the food truck be always be stationed in the same area / location everyday ? 2) If the Food is prepared somewhere else other than the food truck itself , should both the places be registered and known to the authorities.? I am from Hyderabad, would like to start food truck business with andhra items along with chainees food, please let me know How is food truck business in Bangalore? I would like to open a food truck business in Bangalore. How much will be the investment required? i would like to serve only biryani during lunch time? I am working on developing a food truck forum in Mumbai, and I will like to contact with you because it seems you know about the subject, and our main proposes is to make the people aware of this new business and it’s way of living. Since the last year I have been running 9 food truck festivals in different places, and I will like to have a meeting with you for sharing synergies and maybe, collaborating together. I want to open food truck in Delhi. what is the process?? I am interested in starting a food truck business in hyderabad. But getting all the licences seems to be a big hurdle. Suggest some person/lawyer to get all the licences. I m malhar from ahmedabad . I want to know how to get best cook for specific items . Hi this is Ashok,I am interested in starting a small village food truck business in Hyderabad and iam looking for good partner. Please any one interested please contact me on Watsapp – 9063775378. Any idea how much money and time we’d be shelling out to get all those licences?? 2) Where can I find a chef in mumbai for the food truck. Also I am looking for a partner in this venture. I am planning to open a food truck in Pune city.. but I want to make it moving all around the city as per the time table… Which I will study. Secondly. If I want to make my own food truck can it be done in a van like Tata winger? How much it will cost? And lastly if I want some manpower to work along with me and who have a commercial vehicles licence can it be done. I am Kapil. I am planning to start food truck business in my hometown. Can you please tell me the exact information where we can get the fully designed food truck and the contact details. I am from Pune and very much interested in having a food businesses. Hi, I wish to know the suppliers in Pune for the food trucks, kitchen equipment and other material.